Collier County was in the process of updated its Wellhead Protection Ordinance and needed to update the modeling tools and methods used to define the Wellhead Protection Zones. The County also was concerned about the storm water collection and drainage system potentially contributing pollutants to potable water supply wells completed in the Surficial Aquifer System. The purpose of the project was to develop an updated groundwater model for the County, define current groundwater capture zones for the specified wellfields, assess contributions from the surface water network and recommend new wellhead protection zones for each wellfield. Updating the Collier County MIKE SHE/MIKE11 model – including recent improvements taken from the Rookery Bay Watershed model, the Big Cypress Basin FloodWatch model and data from the Lower West Coast Water Supply Plan model. Development of high-resolution, local scale models for individual wellfields. Application of forward and reverse particle tracking methods to define the groundwater capture zone around each wellfield. Evaluation of potential contributions to groundwater from surface water features. Delineation of protection zones for the identified water sources. Evaluation and estimation of contribution areas and flow paths around areas of concern and identified groundwater monitoring wells. LAGO developed high-resolution, telescoped models for 10 public water supply wellfields and produced preliminary Wellhead Protection Zone maps in GIS format for County review. The preliminary protection zones were developed from the groundwater capture zones and modified to include surface features such as lakes and canals that have a high potential of providing water to the wellfields. 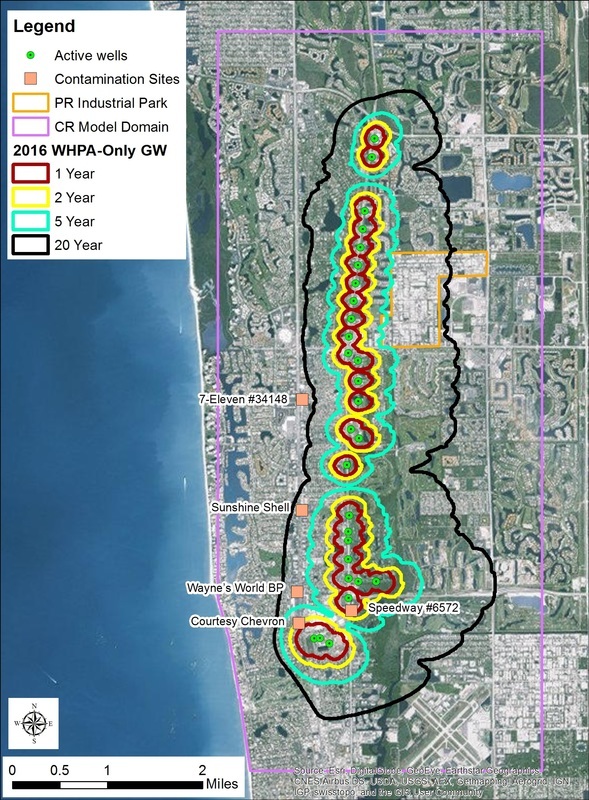 LAGO also completed an analysis of flow patterns around know contamination sites in Collier County to assess the possibility of pollutants reaching water supply wells. ​LAGO provided Collier County with preliminary Wellhead Protection Zones for 10 potable water supply wellfields in the County. Each protection zone considers the potential contributions from the surface water drainage network. The County is currently using the results from this study in preparation for updating the County’s Wellhead Protection Ordinance.